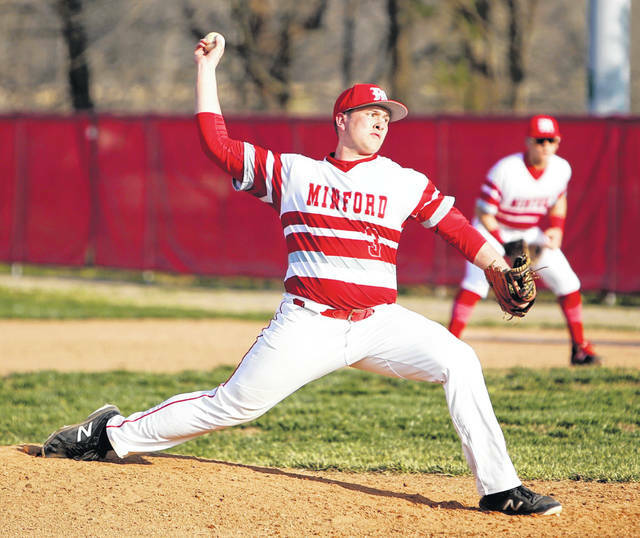 Minford’s Ethan Lauder has been electric on the mound this season. The senior says the key to his success has been letting his defense work behind him. MINFORD — All too often, high school pitchers are worried about striking hitters out. Ethan Lauder is not one of those pitchers. Minford’s senior ace proudly admits you won’t find many strikeouts on his resume. Instead, you’ll find outs … and a full repertoire at his disposal when it comes to recording them. As expected, Lauder has been an imperative piece to the Falcons’ puzzle this season. The group sits at 11-1 overall with an 8-1 mark in the Southern Ohio Conference. The team’s 11th win came on the back of Lauder’s pitching gem this past Wednesday in a 5-3 win over Wheelersburg. It was a win that screams vintage Lauder … he had just two punchouts but held one of the conference’s best offenses to two earned runs on nine hits. Wednesday night’s game was a big stage; a platform that Lauder is more than accustomed to. After helping last year’s team win a Division III regional title and post a final overall record of 24-3, Lauder has seen his fair share of the limelight. So, Wednesday was a breeze. He’s put a system in place for those types of situations. While no moment is too big for Lauder, he understands that every single night in conference play represents a sizable challenge. There are no nights off in the SOC II, no matter the foe. That last sentence embodies Lauder as a player. Some play for the glory, some play for the newspaper clips. Lauder plays for the love of the game. To get to where they want to be, the Falcons still have 11 regular season games remaining — including two dates with Waverly and West, alongside contests against Ironton, Whiteoak and Adena. But with Lauder leading the charge, alongside the likes of Elijah Vogelsong, Luke Lindamood, Reid Shultz, Darius Jordan, Brayden Davis, etc., the right-hander has no doubts his team will return to the exact level it saw its season end last year. And this go-around will be much different from the last — an 11-0 loss to Coldwater in a Division III state semifinal.